Let's face it: Life as a Mom is busy! Whether you have one babe or a houseful, it often seems there are never enough hours in the day to get everything done and still be present with your little ones. My constant focus -- especially as we prepare for Penelope -- is to give 100% of my attention to my girls when they are awake and save my "to-dos" for nap time and after bedtime. I've watched as time has flown by and Olivia has grown from an itty bitty baby to an intelligent and independent little lady right before my eyes in what feels like a single moment, and no matter the demands on me in every other realm of my life, I want to go to bed each night knowing I didn't miss a thing as a Mama. That being said, one of the to-dos that always seems to be on my list is finding the perfect gift for expectant Mamas, because all my girlfriends are either pregnant or just recently had babies. Today I'm so excited to share my newest obsession for gift giving (and if we're being completely honest, for finding the most gorgeous pieces for my own girls) -- Noble Carriage, an online shop -- owned by Jen Hartford -- for top of the line 100% organic baby clothes and eco-friendly toys and accessories; their mission is quite an ambitious one and, well, noble. "We started Noble Carriage as a way to address the growing concerns of sustainability in fashion and the harmful effects that this industry has on farmers, the environment, and ultimately the end consumer. This challenge is far greater than just one company can tackle, so we focused our efforts where we could have the most profound effect: babies." 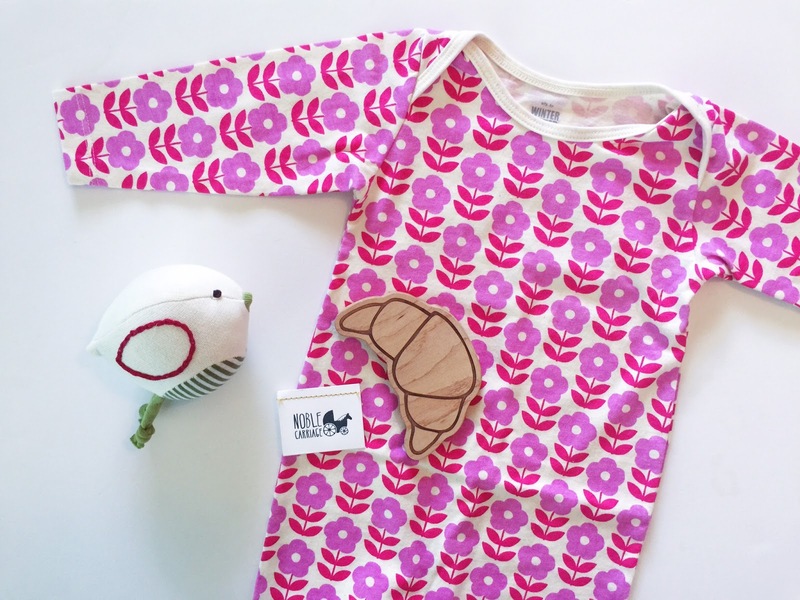 "Truth is, most non-organic cotton is not good for babies or the environment. The use of toxic chemicals to treat cotton and dye the clothing makes even the cutest clothing harmful for a baby’s skin. In the first few years of life, your skin will be the most susceptible to whatever it comes in contact with. Therefore, wearing organic clothing, using eco-friendly cleaning products, and eating healthy food are invaluable to a baby’s long-term health." Owner of Noble Carriage, Jen Hartford, is an award-winning designer by way of San Francisco ad agency, Hub Strategy and Communication. She also co-founded the made in the USA bow tie brand Tasty Ties, where she developed the brand from the ground up and learned first-hand about manufacturing a product. In 2014, Jen gracefully switched gears into her newest endeavor as founder and creative director of Noble Carriage, an online shop for organic baby clothing. 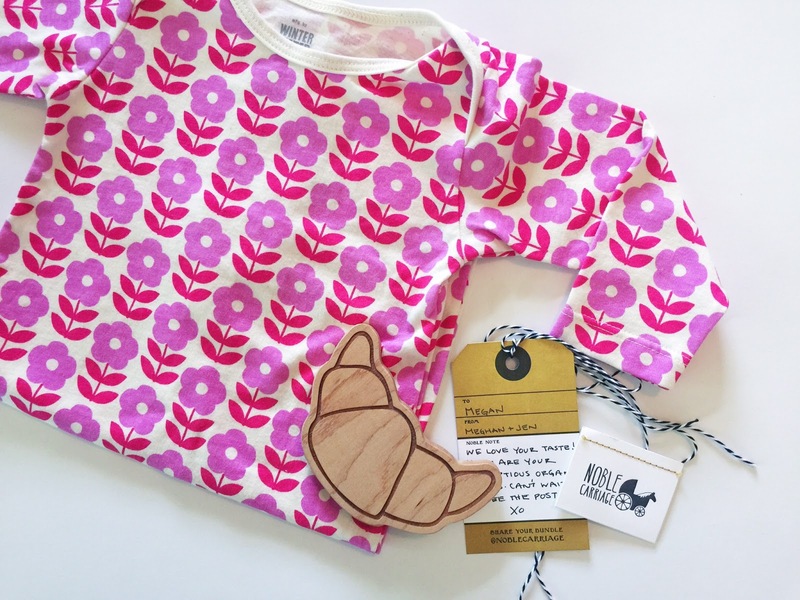 Jen Hartford created Noble Carriage to help moms find clothing for their baby that is not only super cute, but good for the baby and the planet. When you visit the Noble Carriage website, you can trust that every product has been hand selected and will be safe for your baby and the environment. In addition to hand-picking your favorite goodies from Noble Carriage, they offer Organic Gift Bundles that take all the guesswork out of choosing a gift for a new Mama; these are curated boxes with 3-4 items in each by theme. In addition to their wide selection of products by many of my favorite brands, they offer free shipping and free returns on all orders. 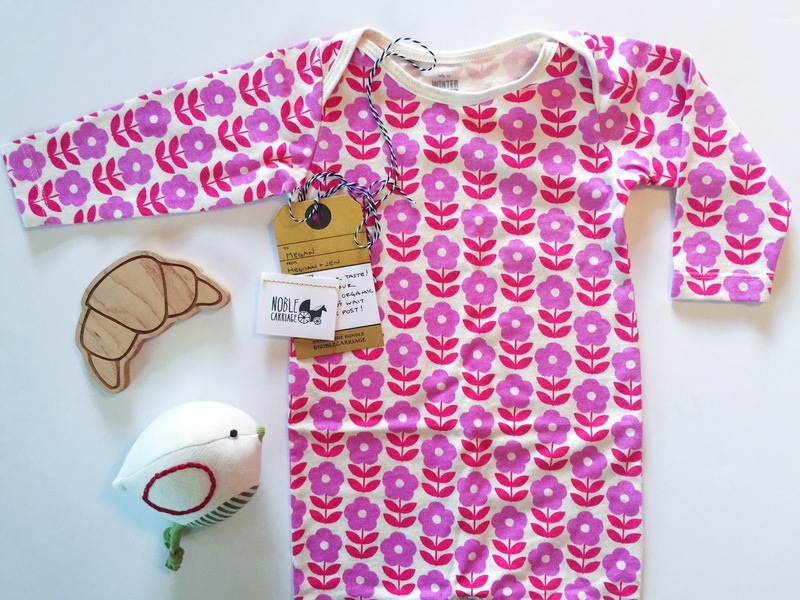 A few of my other favorite items from Noble Carriage include this gorgeous organic floral dress (on sale! 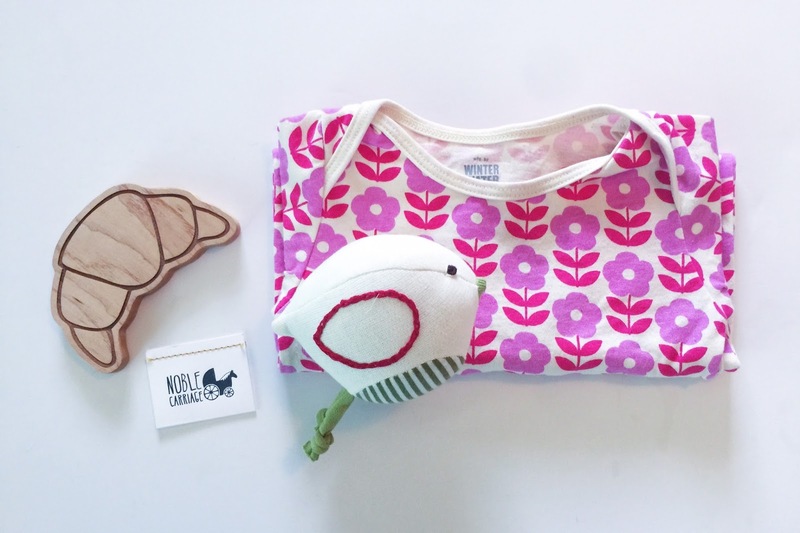 ), this wooden donut teether & all the darling animals from Hazel Village. Everything from Noble Carriage just has me swooning. These beautiful goodies for Penelope feature three of my favorite eco-friendly companies and I love the convenience of picking them all out in one place! Their mission, customer service and products are truly the best of the best! Whether you're looking to add a few high quality pieces to your own child's collection or pick out a gift that will forever be cherished, Noble Carriage is the place to do it. And because we love Noble Carriage so much, I'd love to give away a $75 shop credit to one of you to pick out your favorite pieces! TO ENTER, head over to my instagram @blessednestblog, find the photo with our favorite items as pictured above and follow the steps listed. The giveaway will run from Thursday August 20 through Wednesday August 26 and the winner will be announced directly beneath the original post on IG. The winner is responsible for contacting A Blessed Nest within 24 hours or a new winner will be drawn. And if you just can't wait, visit the Noble Carriage website to sign up for their email list and you'll receive a 10% off coupon for your first purchase!